Base narrow canine teeth is a condition in which the lower canine teeth strike the palate causing pain in your pet. 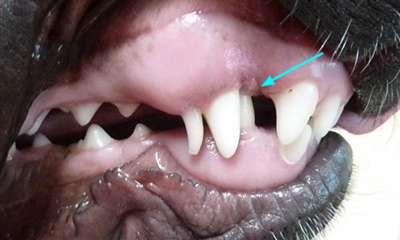 Can affect young puppies when the deciduous teeth erupt too narrow and contact the palate. Can occur in any breed but is more common in breeds with longer narrow facial structure such as Standard Poodles, Collies, Labradors, and German Shepherds. Base narrow canine striking the palate. 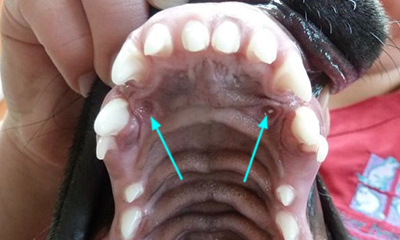 Palate contact points caused by base narrow canine. Schedule an appointment today to have your pet evaluated for this condition. 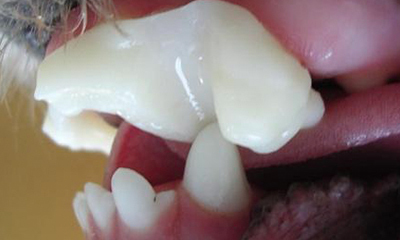 This is a painful condition as the lower canines will strike the roof of the mouth (palate). Remember, the upper jaw (maxilla) is wider than the lower jaw (mandible). Base narrow canine teeth can occur in any breed but is more common in breeds with a longer narrow facial structure such as: Standard Poodles, Collies, Labradors, and Shepherds. 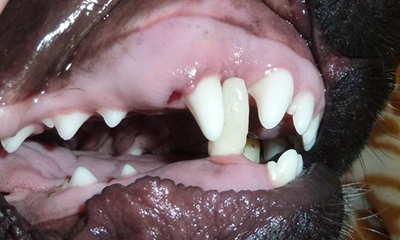 This condition can affect young puppies when the deciduous teeth erupt “to narrow” and contact the palate. More commonly, in young adults at 6 months of age, when the lower permanent canine teeth erupt in an upright orientation. The adult canine teeth will eventually strike the palate causing pain. 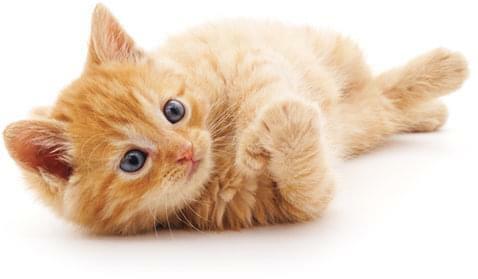 Therapy depends on the tooth orientation, the age of the pet and his/her disposition. Many cases are treated with composite tooth extensions (Incline capping therapy), while others will require an incline plane (bite plate) to be fabricated to apply tipping forces to the lower canine teeth. These techniques apply specific tipping forces on the mal-aligned teeth over 4-8 weeks.